Last week the rescue team PIT tagged all of our cold-stunned sea turtles. A PIT (Passive Integrated Transponder) tag is used in a variety of different animals. Each tag has an alpha-numeric code programmed into the small chip. This is then injected into the triceps of the turtle. This type of tag is also used for cats and dogs. If an animal is found a veterinarian can pass a reader over the animal and it displays the number for that tag. The number is then searched in a database and the animal's owner can then be located. Here the needle syringe that holds the PIT tag is inserted into the triceps of the turtle. If one of our turtles is found again either at sea or more likely on a nesting beach a researcher equipped with a scanner can get the turtle's unique number. Submitting this number to the Cooperative Marine Turtle Tagging Program can determine if the turtle had once been at the New England Aquarium. Sometimes they are also found in precarious positions. 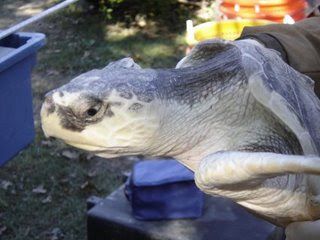 As was the case for a Kemp's ridley sea turtle named Anka that stranded in 2005 and was released in 2006. This turtle was found in a pound net by The Riverhead Foundation on Long Island in New York on October 16, 2006. After being scanned by a PIT tag reader it showed that the turtle had a tag and it was able to be tracked back to the Aquarium. The sea turtle had been released that summer. This picture shows Anka after being brought in from the cold-stun to the Aquarium. The Aquarium helped care for the turtle and release it. This picture was taken after it was found in a pound net in Long Island, New York after it was released. Anka did survive it's run in with the pound net and was later released by the Riverhead Foundation. Sea Turtle Enrichment: Goose eats his greens! Route and Bruce Go South!